Time for some more Bike Talk; a part 2 to my initial review. My Troll’s taken on various incarnations since I first set it up in Costa Rica. It’s that kind of bike; its character lends itself to experimenting with different builds. Run it with discs or V brakes, fully rigid or with a suspension fork, as a singlespeed or with gears (be it conventional derailleurs or an internal hub). Whatever takes your mood, fits your riding style, or suits your pockets. A couple of recent questions on details of its build have spurred me into listing the parts that currently reside on this chameleon of a frame. Bear in mind that despite the changes and tweaks, the underlying theme has always been the same. At its core, it’s a ‘peace of mind’ build for overseas, dirt road and singletrack touring. The Surly Troll, built extra beefy for remote, dirt road touring. 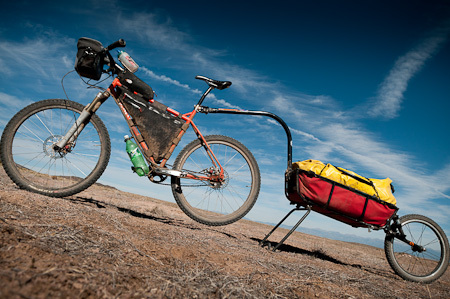 Seen here with Marzocchi suspension and a Tout Terrain Mule trailer, under the clear skies of Colorado – on the Great Divide. 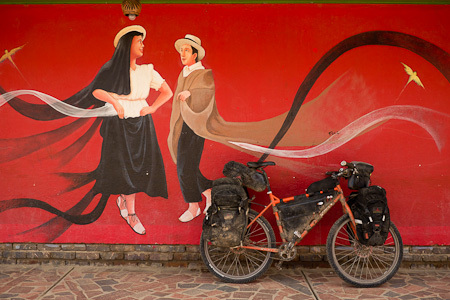 And fully rigid with a full compliment of panniers amongst the backroads of Northern Colombia. 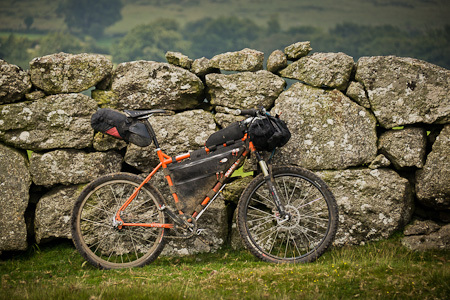 And in lean bikepacking mode on the Devon Coast to Coast, with a Reba suspension fork and lightweight front wheel. I had eyelets added below the downtube for extra water carrying duties. Big Brother Ogre is fortunate enough to have these fitted – as well as Anything Cage mounts on the fork – from new. It would be nice to see the same on the Troll, as plentiful H2O capacity is always a good move. The 105mm Marzocchis are known to be on the long side in their measurement from axle to crown. I’d prefer a shorter travel fork – still coil sprung for peace of mind – as the front end feels too high on climbs. Despite their added complexity, I prefer a suspension fork for exploring more technical, singletrack side trips. Otherwise, I’d stick with the stock rigid blades and a fat tyre. Ragley Carnegie handlebars – a generous 25 degree sweep, a spacious 685mm wide. WTB Speed V saddle – each to their own! I favour a handlebar with more sweep than normal, as it helps take pressure of the wrists. It does, however, rule out the use of my favourite bar ends – Cane Creek Ergo Control IIs. Avid BB7 – low maintenance, mechanical disc brakes, fitted with 160mm rotors. Shimano XTR brake levers – an old set I already had, lots of adjustment and modulation. I’ve moved from my original V brake setup to discs to maximise mud clearance. Spares pads are easy to source nowadays in major cities all over Latin America; I’m currently trying out Yokozuma Long Life pads. Rigida Andra 30 rims, CSS coated. Hope 32 hole front disc hub ( replaced a Chris King hub that failed twice), Rohloff 32 hole rear. Assorted tyres – Schwalbe Marathon XR, Extreme, Dureme and CST Caballeros. I started my ride with V-brakes. Teamed with Swiss Stop Blue V brake pads, the CSS coating on Rigida’s Andra rims proved unbelievably tough and long lasting – mine look almost new, despite 20 000kms of hard use, and haven’t needed a single true (great wheelbuilding by SJS Cycles). I’m running the non-eyeletted versions drilled for Rohloff use, which lessens the chances of broken spokes. The downside to these rims, whether CSS coated and Rohloff drilled or not, is their heft (735g) – all this rotational weight really deadens the ride. For derailleur use, the super tough Rigida Sputniks are cheaper and lighter (630g). Both of these are overkill if you pack light, or pull a trailer, in which case the 540g Rigida Grizzlies could be a good choice. For those in the US, the 580g Rigida Cliffhangers look to be a sturdy, middleweight option. I prefer a large volume tyre for extra comfort and grip – particularly with a rigid fork. For heavy duty, long distance dirt road touring, I used to run a heavyweight Schwalbe Marathon XR at the back teamed a lighter, grippier Extreme at the front. Unfortunately neither of these are made anymore. The equally hefty Mondial replaces the XR; I’d pair it with a lighter and grippier front tyre for off road riding, as tyre wear isn’t really an issue up front. Although I prefer Schwalbes, I’ve also run CST Caballeros for dirt road touring in the States, as they’re cheap and do the job. As an aside, it’s best to pair your front and rear rims. Failures generally come at the back, in which case you can migrate your front rim, using the same spokes, and find a cheap front wheel to replace it. This is especially important if you run a Rohloff, as the short spokes can be a pain to find. Another word of caution – don’t pump large volume (2in +) tyres too high, or you can split the rim. I ran a square taper bottom bracket initially, as I figured this tried-and-tested system would be long lasting and easy to source. As it happens, outboard bearing cranksets are omnipresent in any high end bike store in Latin America (of which there are many), and arguably easier to find than the exact bottom bracket shell/spindle length configuration you may need. I’ve run the same Rohloff Speedhub for seven years, moving it from frame to frame. Aside from oil changes, it only recently needed replacement bearings, so has more than recouped its cost. The Rohloff is heavy but it’s less delicate than derailleurs – good news when transporting the bike. It allows gears to be changed from a standstill – useful when the bike is fully laden. Keeping cables clean and kink-free is my main concern, as this can adversely effect how easy it is to shift gears. Another downside to the Rohloff is that you’re locked into a particular rim. This isn’t such an issue on a long tour, but hampers the bike’s versatility when you’re back home. Topeak Modula Cage XL – holds 1.5 litres of H20 below the downtube. Seeing as my Porcelain Rocket framepack rules out water bottle mounts within the frame, these two cages give me around 2.2 litres of water carrying capacity directly on the bike. I tend to remove the Top Cap Cage mount when mountain biking, so carry a spare standard top cap. I’ve also sometimes added a couple of hose-clamped water bottle cages to the fork for another 1.5 litres. When I run a rear rack, I prefer the Tubus Cargo as its relatively light (620g) yet will still carry some heft. A little more mud clearance would be nice. For a extra stowage on the fork, Anything Cages are an option, holding 4L apiece, for just 100g each. They’re more delicate though. You can build up a Troll as simple and low tech as you want, but I like to embrace the advantages of internal hubs, disc brakes and suspension. If you travel light, the setup I’ve listed is certainly overkill. Yet, despite its expedition-style build, I’m still always pleasantly surprised with how much I enjoy riding the Troll, both stripped down on technical singletrack, or loaded up to the gills on a big tour. You can never shoehorn everything into one frame, or build a bike up and expect it to shine in every kind of condition. But in my book, the Troll let’s you get pretty close. This entry was posted in Bike Talk and tagged Rohloff Speedhub, Surly Troll on March 18, 2012 by Cass Gilbert. How did the anything cages work on your sus forks. Heading to do the munda biddi trail later in the year. Was wondering if that would be ok or get some eyelets brazed on my fork and go rigid. Any thoughts would be appreciated. ‘Anythings’ worked fine on the suspension forks, nice and secure with hose clamps – mine are marked 25/51 for the sizing. They’re a little awkward to take on and off in a hurry, compared to a fork drilled for them – like the Ogre’s. You just need to be careful how you lay down the bike, and when you transport it. They don’t like being pressed from the side. I hadn’t heard of the Munda Biddi Trail before – looks great. This is all great information. I’m planning on buying a troll frame soon and although it will see nothing like the conditions yours does, this blog has been a tremendous resource. Thanks! I’m glad it’s of use. For reference, about how tall are you? I’m 186cm and have been considering either the 20 inch Troll or the size L Ogre. 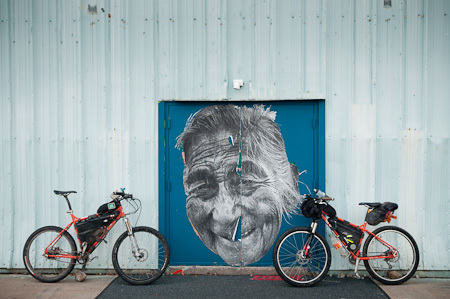 Between the Troll and the Ogre, which would you recommend for bike packing/general mountain biking in the U.S.? I think I’m 184cm – a little over 6′. When I compared the geometry with the Thorn Catalyst I was riding before, it looked like I could have gone for either a 20 or a 22in Troll. Although the larger frame would have made for a bigger framepack, I went for the 20 in the end, as I figured it would be a slightly stiffer frame and more nimble ride. I made up the reach with a touch longer stem, and it works nicely. I guess you’d be in a similar situation. Likewise, the 20in Ogre frame feels good – seat tube and effective top tube seem to be pretty much the same. I’d check out the Ogre thread on MTBR, I’m sure there’ll be some more sizing info and queries to be found there. You know, as much as I love the Troll and the ease and availability of 26in wheels, for bikepacking needs and riding in the US I’d go for the Ogre. It comes with all the added eyelets, which is cool. And it rides really nicely with wide volume tyres and a rigid fork. I like the way 29ers roll – both offroad and on pavement. They certainly seem to fit better for taller people – I feel less like I might go over the handlebars. The downside is a little extra weight in the frame and wheels, but this can be offset by running a rigid fork rather than suspension – which I feel is more of a need on a 26in bike, unless the terrain is particularly rocky. All things being equal, big wheels aren’t going to be quite as strong, but I don’t expect there’s much in it. The Ogre’s not the lightest of framesets… but then neither is the Troll. That’s not what you get a Surly for! It’s always tough when you fall between two sizes. What size Big Dummy do you ride? I just thought, you might check out the Salsa El Mariachi too if you’re running discs and not planning on panniers. My friend Daniel built one up (with a Rohloff) and seems to really like it. You’d lose the water bottle under the downtube, but could run a Fargo 2 fork for Anything/water cages up front. Overall, not quite as versatile but most likely a little lighter. Wow! Thanks for the detailed and thoughtful response. There’s nothing like getting in-depth impressions from you, who have quite literally lived on the bikes in question. I express my appreciation on behalf of a likely small but grateful group of enthusiasts like me who are not able to easily find examples of these bikes for test riding. While I am at a stage in life that I couldn’t embark on a journey such as yours, I am hopeful that I can carve out some segments of the Great Divide trail through my native states of Colorado and Wyoming. I’ve ridden a 22″ Big Dummy since 2008, and although it fits fine, I sometimes wonder if I should have chosen a 20″. On the other hand, I also have a 58cm Surly Cross-Check that I sometimes wish was a 60cm. As much as I love their bikes, I seem to fall between two sizes in the Surly realm. However, as I hope to use either the Troll or Ogre mostly off-road, I’m leaning toward the 20″ models. I’ve ridden 26″ wheeled mountain bikes for over 25 years, but have been increasingly intrigued by 29ers. I got a taste by putting some 40c knobbies on my Cross-Check, which was fun but it doesn’t really ride like a mountain bike. Your feedback has made the Ogre a very appealing next step, although the El Mariachi looks like a great alternative. To muddy the waters, I’ve also been exploring the Pugsley, which is effectively a 29er in rolling diameter, as well as Jeff Jones’ very creative steel 29ers (http://www.jonesbikes.com). I frequently ride my Big Dummy carrying cargo or passengers, so any other bike is likely to feel considerably lighter. Anyway, thanks again for your insight. I always look forward to living vicariously through your adventures. Nice write up, as always, Cass. The Troll vs. Ogre debate seems like a tough choice. I think we both agree that unless you’re traveling long term in areas where 29er tires and rims aren’t available the Ogre wins. Are you still in the US? Thanks Gary. Yeah, big wheels rock! I’ve been checking out some interesting Schwalbe tyre options and tough Velocity rims. I’ve used Smart Sam’s before when I’ve toured, and noticed they’re now doing them as a 29×2.1. Only non-folder it seems, but probably a relatively tough option, and only $25 on Amazon. Still in the US… I’m excited for you about your tour! I have yet to really explore the options, but apparently the Troll – with a little less standover and a higher BB – happily fits 650bs too. The rim/tyre options there are really growing… Not that you necessarily want a third wheelset (!) but could make an interesting alternative. For general use, Schwalbe Marathon Extremes, in a 2.25, have been fine. Clearance is only really an issue with unusual amounts of mud, like I had in Mompos. For these kind of situations (I’ve had a few similar stretches along this journey) a boxier design would be better, but I’ve yet to find anything that’s as light yet robust as the Cargo. Was just wondering, ( and may be of interest to others considering a build) seems like you’ve put the Troll through some tough wet and muddy conditions, any sign of rusting on the frame anywhere? Surly suggests using frame saver but the process seems to be a bit troublesome and uses a slightly toxic material. is it necessary do you think? Can’t say I’ve noticed any issues, but I think structural rust is more likely to take a few years to show itself. As a preventative measure, I think it’s a good idea to use some kind of guard – I did it to my Thorn before. If you don’t want to use JP Weigle’s Frame Saver, I’ve heard linseed oil works pretty well too. Thanks for the offer Tom – I do hope to make it to the Lost Coast one day! It’s seat post mounted and uses a 20in wheel, both of which are good news in my book. And it folds. I’ve never tried it though, or met anyone touring with one. No fenders? Seriously? And you tour in rain and mud? A rainy, paved tour – and I’m all about it. But have you tried riding with full fenders on muddy dirt roads?